Welcome to my third review as a member of the Homeschool Mosaic review team! As I’ve mentioned before, I was homeschooled for most of my formative years, and I plan on homeschooling my children- at least while they’re very young. My mother taught me to read, and I intend to do the same for my kids. A family-owned corporation, Apologia curriculum grew from the desires of a small group of Indiana parents. They wanted their children to have not only a good education but one that would develop their Christian faith. Growing from just one textbook, Apologia now has dozens of textbooks and resources for homeschooling kids and their parents. Apologia also has an online academy for students grades 7-adult in science; and Bible, apologetics, and world-view. Homeschooling moms can attend Apologia retreats to encourage and inspire one another in their journeys. Upcoming retreats include Baltimore and Atlanta. 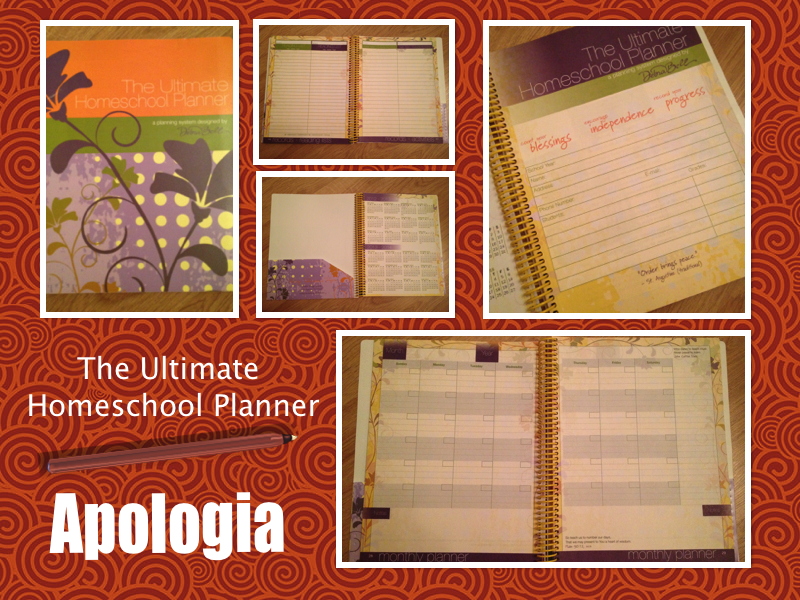 To review, I received Apologia’s “The Ultimate Homeschool Planner” (RV $28) and “The Ultimate Daily Planner for Students” (RV $19). Made for homeschooling moms (or dads), The Ultimate Homeschool Planner is available in two colors, so choose one that better fits your personal style. 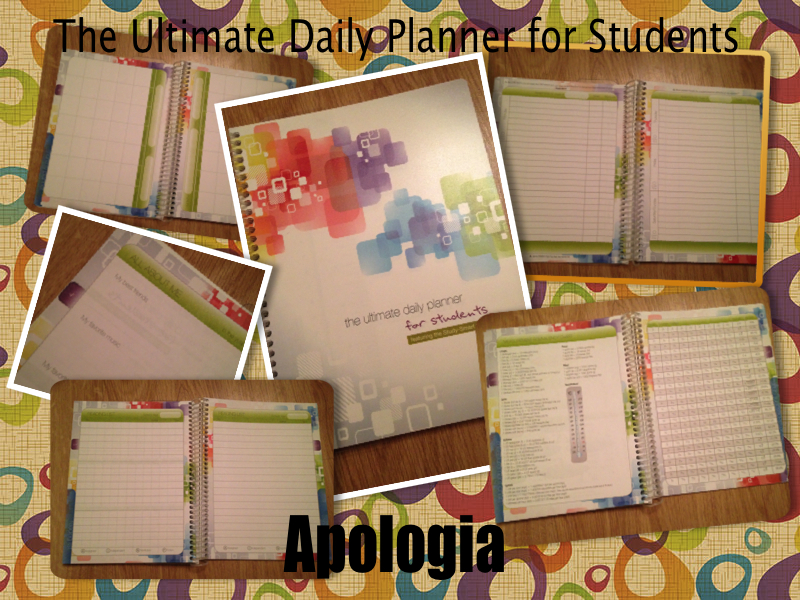 Since The Ultimate Daily Planner for Students is intended for 4th to 8th grade, Apologia also sells a weekly planner for teens (7th to 12th grade). Created by author, educator, and veteran homeschooling mom Debra Bell, the ultimate planners are designed to work together, but can be used alone if need be. The idea is that as children grow, they will take more planning responsibility on themselves. The parent planner spends 12 pages in the beginning giving information and detailed directions, explaining how to use the planner effectively. This User Guide section includes illustrations to really break it down. There’s a monthly planner section, allowing you to plan out your entire school year, but the bulk of the planner comprises weekly planner pages. The planner contains pages for reading lists, and a place to list field trips and outside activities. At the very back of the planner, you can find tips about learning styles and how to motivate reluctant students. There’s even a handy guide to help you look toward and map out your child’s high school years, as well as a place to write a summary of the year. To grow as a teacher, it’s important to self-evaluate and set new goals. This planner begins with a section for students to fill out personal information and set goals for themselves. Next comes six pages called the “Study-Smart Student Toolkit” that help students stay organized, manage their time better, and work independently. There’s a monthly planner section, but like the teacher planner, the bulk of this book is the daily planner, followed by a grade records, reading list, and activity log. The back of this book contains references like a history timeline, maps, and conversion charts. I’ve heard great things about Apologia curriculum from homeschooling moms, and I’m looking forward to using their textbooks myself. As a professional educator, I enjoyed this planner. The planners we’re given as public school teachers are usually very “bare bones.” The teaching tips included in The Ultimate Homeschool Planner really make it appropriate and helpful for homeschooling parents who may not have a background in education like myself. Finally, I didn’t cover all the sections included in the planners (I’d be typing for hours), but the planners really do have a lot to offer. Once all the reviews from the Mosaic Reviews team members have been published, I’ll update this post with a link, so you can see what other reviewers had to say. To learn more about Apologia, visit their website and check them out on Facebook and Twitter. Wow! I love those planners! When I used to teach, planners were practically my holy bible! These are so cute, fun and bright, plus have everything you need to keep yourself very well organized! I’m thinking of homeschooling (my kids are only 3) but I’m currently collecting information and will definitely put this on my list. Thanks for sharing. Follower on Google+ (https://plus.google.com/117146120519608211142/posts), Pinterest (http://pinterest.com/journeyofthezoo) and StumbleUpon (http://www.stumbleupon.com/stumbler/JourneysofTheZoo). These look great! Home schooling my son is definitely something I am considering. My friend of 6 kids needs one of these. She homeschools and has bitty ones too. It definitely is a big decision. I know that as long as we’re financially able to, I’ll homeschool my son through preschool-early elementary. I want my kids to have the same field trip, library, etc. experiences that I had.